Sarah is an articulate guinea pig with an outstanding sense of humor and a positive outlook on life. She and her sister, Molly, are owned by Katie. But not surprisingly, they are typically cared for by Katie’s mom, lovingly known as “Moozie”. Thankfully, Sarah has a terrific sense of adventure, otherwise life for her might seem to be a bit out of control. 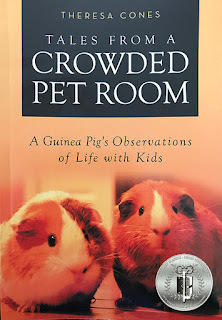 Tales from a Crowded Pet Room, by Theresa Cones, is the true story of one very loved guinea pig, along with the humans and non-humans who live together in the Cones’ household. Genuinely funny, with occasional tender moments, this book is sure to resonate with pet lovers of all ages. Recommended for home and school libraries, Tales from a Crowded Pet Room has earned the Literary Classics Seal of Approval.